This is the salad I will be eating all spring. 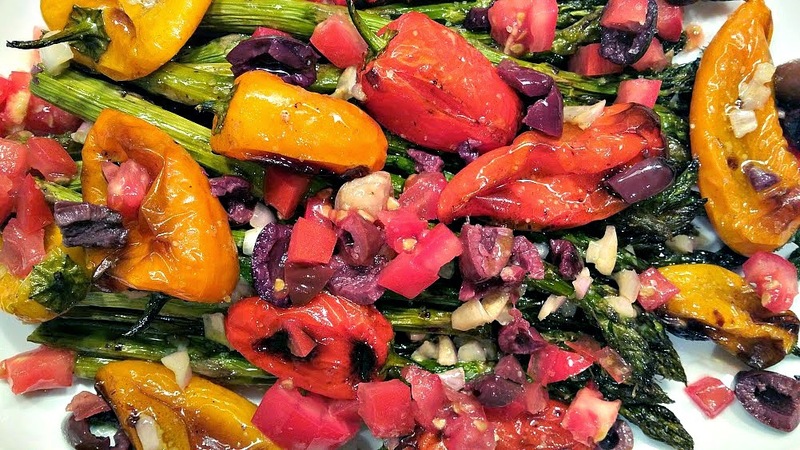 Roasting asparagus and peppers bring out the sweetness of the vegetables. Adding a vinaigrette made from Dijon mustard, sherry vinegar, extra virgin olive oil, shallots and ingredients like olives, tomatoes and capers creates a delicious, warm salad perfect for all your spring menus. 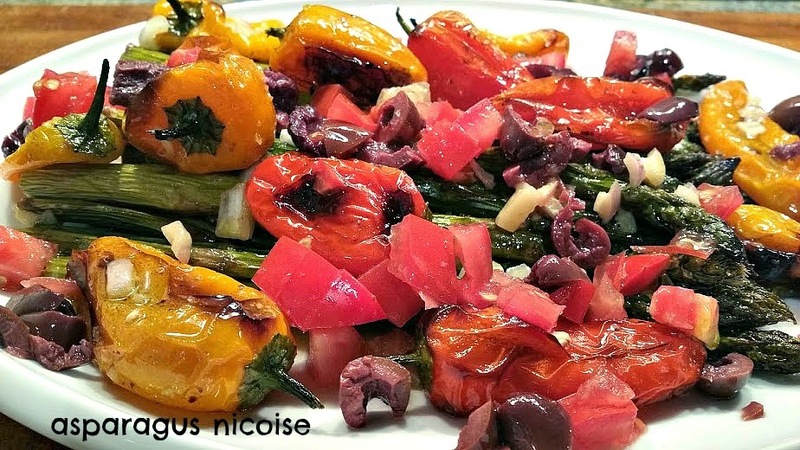 I like to serve the Nicoise with roasted chicken, beef or salmon. Or, for a vegetarian option, try pairing with Parmigiano-Reggiano and crusty french bread. Add a glass of lightly chilled rosé wine, and dinner is served. Enjoy! Note, traditional Nicoise salads include anchovies, potatoes, and tuna. You can include any/all of these ingredients in this recipe, but I prefer it as is. Snap off the woody ends of the asparagus and peel if stringy. (You probably will only need to peel very thick stalks. Thin stalks are usually fine as is). Place asparagus in single layer on prepared sheet and drizzle with olive oil. Using your hands, roll the asparagus in oil until coated on all sides. Add peppers to the pan and drizzle with oil. Generously season with salt and pepper. Roast in the oven for 15-30 minutes or until the asparagus and peppers are beginning to brown and caramelize. Cooking time depends on the thickness of the stalks. Remove from oven and set aside. Meanwhile, whisk together the mustard, shallot, vinegar and a pinch each salt and pepper. Slowly whisk in the olive oil until thoroughly combined. Drizzle 1/4 of the vinaigrette over the warm asparagus and peppers. Toss to combine. 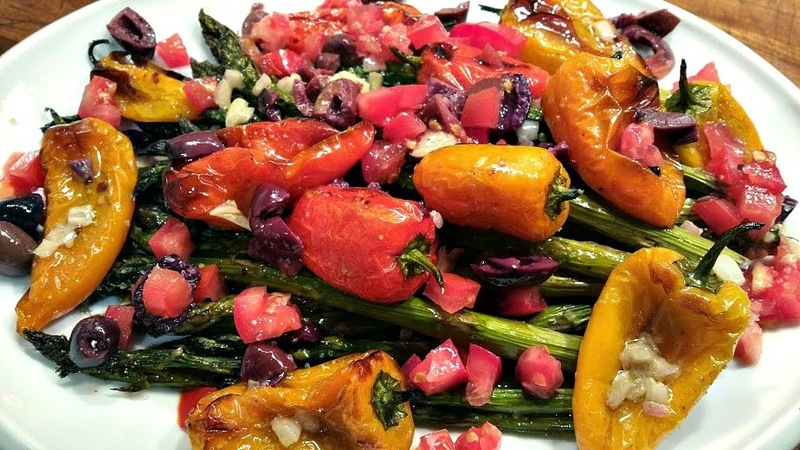 Place the asparagus and peppers on a large platter. Scatter the olives, tomatoes and capers over the top. Drizzle another 1/4 of the vinaigrette over the platter. Taste and adjust seasonings if desired. Serve with remaining vinaigrette on the side. Springtime means the start of sensational side dishes made from fresh, just-picked produce and this week at Food Network we are celebrating Asparagus. Do you have a favorite asparagus recipe? Share in the comments section and/or link to your blog if you have one. And be sure to check out the delicious sounding recipes from my blogger friends and Food Network.